When his L.A. neighborhood was threatened by gangbangers, Stanley Tookie Williams and a friend formed the Crips, but what began as protection became worse than the original gangs. From deadly street fights with their rivals to drive-by shootings and stealing cars, the Crips’ influence — and Tookie’s reputation — began to spread across L.A. Soon he was regularly under police surveillance, and, as a result, was arrested often, though always released because the charges did not stick. But in 1981, Tookie was convicted of murdering four people and was sent to death row at San Quentin in Marin County, California. Tookie maintained his innocence and began to work in earnest to prevent others from following his path. Whether he was creating nationwide peace protocols, discouraging adolescents from joining gangs, or writing books, Tookie worked tirelessly for the rest of his life to end gang violence. Even after his death, his legacy continues, supported by such individuals as Archbishop Desmond Tutu, Snoop Dogg, Jesse Jackson, and many more. 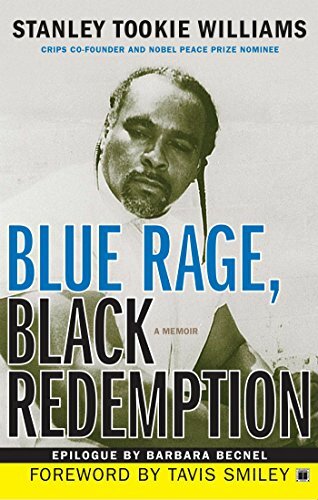 This posthumous edition of Blue Rage, Black Redemption features a foreword by Tavis Smiley and an epilogue by Barbara Becnel, which details not only the influence of Tookie’s activism but also her eyewitness account of his December 2005 execution, and the inquest that followed.